I haven’t had much time to devote to blogging recently, but promise I will come up with a best of 2012 piece soon. In the meantime, here are the ten most popular posts that I wrote in 2012, as measured by Google Analytics. Nine out of the ten most popular events were viewable on video internationally, either as part of the Met’s HD broadcast series or via the Internet (the exception was Jonas Kaufmann’s I’m-not-dead Winterreise, which attracted great interest for another reason). 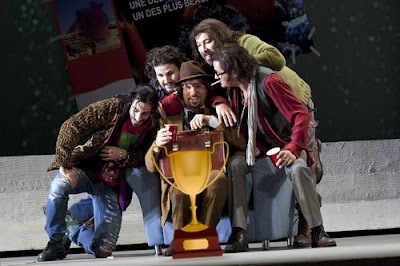 La bohème, Salzburg Festival: Anna Netrebko was so awesome as Mimì that she got both Piotr Beczala and Jonas Kaufmann as Rodolfo. Simultaneously. Jonas Kaufmann, Winterreise, Bayerische Staatsoper. Simple, honest, effective. L’elisir d’amore, Metropolitan Opera. Sorry, you were saying? I dozed off there for a second. Ariadne auf Naxos, Salzburg Festival. A dubious vision ran amok, bulldozing irony in the process. You may notice that many of these assessments are negative. Only one of the performances on this list made my favorite performances of 2012 list, which may be why I run a blog and not a giant opera company, alas. *The performance was in 2011, but I wrote about it in 2012.